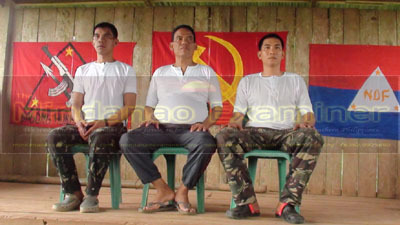 Prisoners of war Lingig town Mayor Hendy Dano, center, and his two bodyguards Private First Class Allan Saban and Corporal Alrey Desamparado shortly before their release from the New People's Army. DAVAO CITY (Mindanao Examiner / Oct. 11, 20110 – A Southern Philippine town mayor who was taken captive and eventually freed by communist rebels has retracted his apology and said he was only forced by his captors to admit his alleged guilt, state media reported on Tuesday. Mayor Henry Dano, of Lingig town in Surigao del Sur province, was freed October 9 together with his two bodyguards who are both soldiers - Private First Class Allan Saban and Corporal Alrey Desamparado - after they apologized to the New People’s Army rebels for their abuses and due to appeals made by various humanitarian organizations. The three men were seized August 6 in a daring raid by rebels on the politician’s house in Lingig town. The rebels accused Dano recruiting militias to fight the rebels and violating civil rights of tribesmen and killing a tribal leader who was opposed to mining activities in Lingig town. While the two soldiers admitted to be involved in covert operation against the rebel group in the southern town. Rubi del Mundo, a spokesperson for the New People’s Army, earlier warned that they will arrest Dano again should he break his promise to reform. “His case is conditionally archived to give way to his release. But in the event that he willfully commits an act or acts that constitute as violation of human rights, international humanitarian law and the laws and policies of the people's government, he shall be rearrested and put to trial,” Del Mundo said. The Philippine Information Agency quoted Dano as saying that he was only forced to admit all accusations against him by rebels. “The Mayor said he had no choice but to admit all the accusations against him because of the difficult situation he was in,” it said. Last month, Dano apologized to the rebel group for human rights violations he committed in Lingig town. “The commission of these acts, in collaboration with the armed troops of the Armed Forces of the Philippines under the Government of the Philippines, resulted in the charges that I am facing in the people's court of the people's democratic government that is based in the countryside. I trust that my apology shall be accepted and that I will be given an opportunity to rectify my errors and change for the benefit of the masses,” Dano said in an audio clip released September 26 by the New People’s Army. The rebels said Dano’s private army was responsible in the brutal murder of a tribal leader –Eduardo Toyogon - in Lingig town. Toyogon, who opposed mining operation in tribal areas in the town, was murdered in October 2010. The militias also served as security forces for the politician’s mining-related enterprises in the villages of Palo Alto and other areas in Lingig where they harassed peasants and tribesmen who are oppose to mining operations in the town, Del Mundo said, adding Dano was also involved in the government’s covert operations against the New People’s Army.